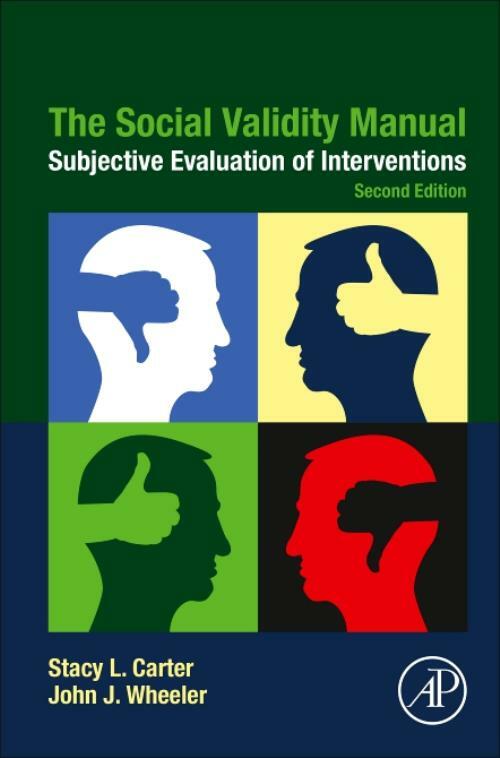 The Social Validity Manual: Subjective Evaluation of Interventions, Second Edition, provides background on the development of social validity, an overview of current research in social validity, and guidelines for expanding the practice of social validation within numerous specialized fields of expertise. The book offers detailed information on scales and methods for measuring social validity across the goals, procedures and effects of treatments utilized in various fields. This second edition incorporates recent research findings and offers two new chapters on the use of social validity in the health sciences and how social validity plays an important role in increasing cultural awareness. Information included in this book has far reaching value as research and application of ABA contribute to a wide range of practical areas, including AIDS prevention, education, gerontology, language acquisition and parenting. Stacy Carter is a Professor in the Special Education Program in the College of Education. Dr. Carter received his Ph.D. in Educational Psychology with an emphasis in School Psychology from Mississippi State University which was accredited by both the National Association for School Psychologists and the American Psychological Association. Dr. Carter is a Board Certified Behavior Analyst and a Nationally Certified School Psychologist. Dr. Carter is also a licensed special education teacher and a licensed specialist in school psychology. Dr. Carter has over 20 years of experience working as a Behavior Analyst in developmental centers, psychiatric hospitals, community living situations, and school settings. Dr. John Wheeler has had over twenty-five years of experience in working with children with autism spectrum disorders and their families throughout his career in special education. He has served as a Professor, Director, Associate Dean and Dean and has also been active in grant funded projects in the areas of professional development and capacity building through technical assistance to underserved and rural schools. He has authored/co-authored numerous research studies in the education and treatment of children with ASD and serves on a number of editorial boards for professional journals in the field. He has authored 6 textbooks, on positive behavior supports, autism and inclusion.